Normal cell growth and development are highly regulated by hormones and factors from the environment, and cells respond to these signals by regulating expression of appropriate genes. Many diseases are caused or influenced by alterations in the relationship between cell signaling and gene regulation. For example, development of cancer can largely be attributed to uncoupling of gene regulation from growth factor signaling. Similarly, the pathology of AIDS is strongly influenced by control of HIV-1 gene expression through T cell activation signals. To elucidate fundamental mechanisms controlling signal responsive expression, we study the regulation of specific transcription factors in human T cells and the model eukaryotic organism Saccharomyces cerevisiae . Our research has been instrumental in revealing how responses to multiple signals can be coordinated through the function of the RNA polymerase II-associated protein kinase CDK8. Additionally, we have identified a human transcription factor that regulates establishment of latent HIV-1 provirus and controls reactivation of viral replication in response to T cell signaling. HIV-1 gene expression is tightly linked to T cell activation, and this relationship contributes to pathology of AIDS. During the course of infection, a population of latently infected resting memory T cells develop which have transcriptionally repressed chromosomally integrated copies of the HIV genome. These latently infected cells are important to disease progression because they act as a reservoir of inducible virus production throughout the course of infection. Furthermore, latent provirus is unaffected by current AIDS drugs, and without new therapies that target this population, the virus cannot be eliminated from infected individuals. Our current research is directed at developing strategies for eliminating latently infected cells, which in combination with anti-retroviral therapy would constitute a “cure” for AIDS. Upon infection of T cells with HIV-1, the virus RNA genome are copied into double stranded circular DNA molecules which become integrated into the host cell chromosome. We have developed a recombinant HIV vector (RGH) where eGFP is expressed from the 5’ long terminal repeat (LTR) promoter, and mCherry is expressed from an internal promoter (CMV), inserted within the nef open reading frame (Figure). 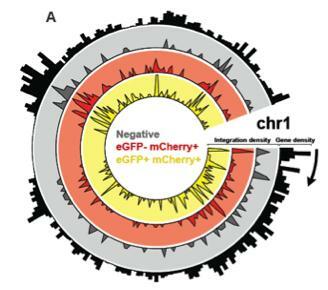 This allows monitoring of chromosomal integration by expression of mCherry independently from transcription originating at the 5’ LTR promoter (eGFP). Using this vector we have shown that HIV produces integrants where LTR expression is repressed immediately upon integration. This contradicts earlier results which indicate that development of latency involves a gradual silencing of LTR activity. Provirus that established early in infection can be activated by T cell signaling to cause viral replication, and we can alter the proportion of virus that forms early silencing by sequence changes within the 5’ LTR promoter. This indicates that the ability to establish latency is intrinsic to the viral LTR itself, and that establishment and maintenance of latency are influenced by the spectrum of transcription factors that bind to specific cis-elements. The HIV LTR binds numerous cellular transcription factors, including one that we have called RBF-2, which is comprised of the proteins USF1, USF2 and TFII-I (Figure). RBF-2 binds multiple sites on the integrated LTR and likely functions to organize the modification of histones and position of nucleosmes on the LTR promoter. Our ongoing research is directed at determining the mechanisms by which various LTR-bound transcription factors regulate formation of latency, and to characterize the role that chromosomal integration sites (Figure below) and LTR bound factors contribute to reactivation of virus in stimulated T cells. We are also using the RGH virus, and various protein-protein interaction technologies, for screening and development of novel drugs and therapies that could be used to eradicate the latently infected cell population from AIDS patients. Most of our current knowledge of the basic mechanisms for eukaryotic gene expression have come from experiments with model organisms such as the budding yeast Saccharomyces cerevisiae . We are studying GAL4 and STE12, two transcriptional activators that control distinct sets of genes in response to nutrient availability and mating pheromone. Our research examining phosphorylation of these factors resulted in identification of a function for CDK8, a protein kinase associated with RNA polymerase II. We have shown that CDK8 activity is controlled by general physiological signals, including nutrient availability and stress conditions to which the cell must mount global alterations in gene expression to enable a proper growth response. Our results show that interaction between CDK8 and specific transcription factors allows for coordination of such global signals with responses to specific signals that regulate smaller subsets of genes. A good illustration of this relationship is provided by the factor GAL4, which regulates expression of genes required for utilization of galactose (Figure 3). GAL4 is an important model for eukaryotic gene regulation because it is subject to control by both positive and negative signals; activity is induced by the presence of galactose, but is inhibited by glucose. GAL4 is phosphorylated during transcriptional activation by both CDK7 and CDK8 of the general transcription factor machinery. CDK8 phosphorylates GAL4 on serine 699, and this modification is necessary for full induction by galactose. Because CDK8 activity is inhibited by nutritional or physiological stresses, we have proposed that S699 phosphorylation functions as a “throttle” for the GAL genes to modulate the activity of GAL4 to levels that are appropriate for the growth environment. STE12 activates multiple distinct classes of genes in response to different signals. In haploid yeast, STE12 is required for activating genes required for response to peptide mating pheromones produced by the opposite mating type. The signal transduction pathway controlling mating pheromone response contains a prototypical MAP kinase cascade, and is similar to growth signal transduction pathways of higher eukaryotes. STE12 activity is regulated by this signaling pathway through interaction with the pheromone-responsive MAP kinases, and the DIG1 and DIG2 inhibitor proteins. STE12 becomes phosphorylated on several residues by CDK8 during transcriptional activation, but unlike GAL4, these phosphorylations target STE12 for degradation by a ubiquitin-proteasome-dependent mechanism during G1 phase of the cell cycle (Figure 4). 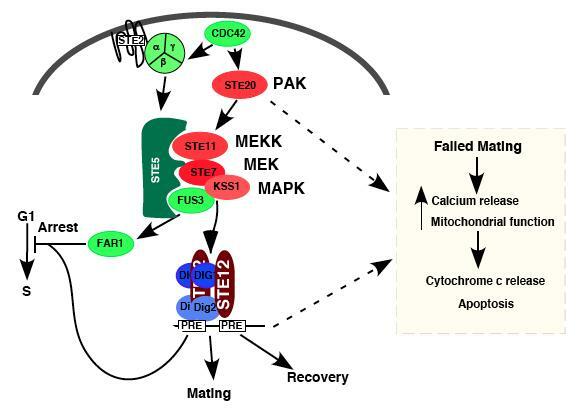 CDK8 activity is inhibited under conditions of nutrient starvation, and we have shown this allows accumulation of STE12 protein for activation of filamentous response genes, a morphological differentiation adapted by yeast to cope with nutrient deficiency. Our current research on these factors is focused on elucidating molecular details of how their phosphorylations and interactions with regulatory proteins control activity in response to specific signaling. Additionally, because both factors are controlled by CDK8, we are using a combination of genetic and biochemical approaches towards identification of the signaling pathways that control CDK8 activity in response to nutritional and physiological cues. These projects will continue to provide valuable insight into fundamental mechanisms for regulation of eukaryotic gene expression by signal transduction pathways. Because of our interest in regulation of transcription factors by cell signaling and protein phosphorylation, we have constructed and maintain a database of experimentally verified protein phosphorylation sites in the proteome of the yeast Saccharomyces cerevisiae. 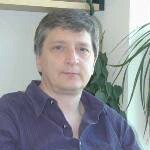 This project represents a collaboration with colleagues in Toronto, Montreal and Princeton, and involves curation of in vivo phosphorylation site data from both high throughput MS proteomics studies, in addition to focused studies on individual proteins or protein complexes. The latest update of the dataset includes documentation of ~20,000 unique sites of phosphorylation, of which ~1,100 have defined function. The database can be accessed at http://www.phosphogrid.org/. Sadowski, I., Breitkreutz, B.J., Su, T.-C., Dahabieh, M., Raithartha, S., Bernhard, W., Barretto, K., and M. Tyers (2013) PhosphoGRID Saccharomyces cerevisiae protein phosphorylation site database: Version 2.0 Update, Database, pending. Bernhard, W., Baretto, K., Dahabieh, M., and I. Sadowski (2011) The Suv39H1 inhibitor chaotocin forces induction of latent HIV-1 provirus in unstimulated T cells. FEBS Letters 585:3549-3554. Dahabieh, M., Ooms, M., Malcolm, T., Simon, V., and I. Sadowski (2011) Identification and functional analysis of a second RBF-2 binding site within the HIV-1 promoter, Virology 418:57-66. Su, T.-C., Tamarkina, E., and I. Sadowski (2010) Organizational constraints on Ste 12 cis-elements for pheromone responsive gene expression in Saccharomyces cerevisiae. FEBS Journal 277:3235-48. Stark, C., Su, T.-C., Lorenco, P., Breitkreitz, A., Tyers, M., and I. Sadowski (2010) phosoGRID: A database of experimentally verified protein phosphorylation sites in Saccharomyces cerevisiae. Database 2012:bap026. Joshi, P., Hirst, M., Malcolm, T., Parent, J., Mitchell, D., Lund , K., and I. Sadowski (2007) Identification of Protein Interaction Antagonists Using The Repressed Transactivator Two-Hybrid System. Biotechniques, 42:635-643. Chen, J., Malcolm, T., Estable, M.C., Roeder, R.G., and I. Sadowski (2005) TFII-I regulates induction of latent HIV-1 in cooperation with USF. J. Virology 79:4396-4406. Nelson, C., Lund , K., Goto, G., and I. Sadowski (2003) Srb10 regulates yeast filamentous growth by phosphorylating Ste12. Nature 421: 187-190. Rohde, J., Trinh, J., and I. Sadowski (2000) Multiple signals regulate GAL gene induction in Saccharomyces. Mol. Cell Biol. 20:3880-3886. Olson, K.A., Nelson, C., Tai, G., Hung, W., Wong, C., Astell, C., and I. Sadowski (2000) Two Regulators of Ste12p function by independent mechanisms. Mol. Cell. Biol. 20:4199-4209. Hirst, M., Kobor, M., Kuriakose, N., Greenblatt, J., and I. Sadowski (1999) GAL4 is regulated by the RNA polymerase II-associated cyclin-dependent kinase SRB10. Molecular Cell, 3:673-678. Hung, W., Olson, K.A., Brietkreutz, A., and I. Sadowski (1997) Characterization of the Basal and Pheromone-Induced Phosphorylation State of Ste12p. Eur. J. Biochem. 245:241-251.